Everyone knows the holiday season is great excuse to enjoy things that you might not otherwise indulge in, whether it's spiked egg nog, or ugly sweater parties, or spreading rampant gossip at the office Christmas party. And this year, you could also get a chance to try some limited edition seasonal Wawa booze, because the wildly popular convenience store is releasing its first ever beer, and it sounds delicious. 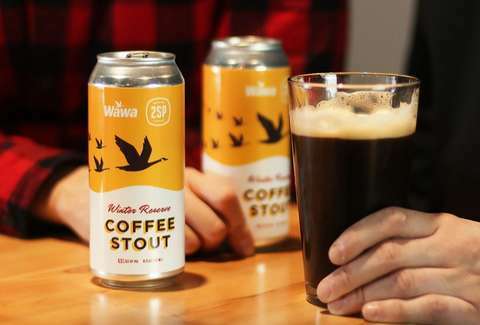 Wawa, the deeply adored Pennsylvania-based convenience store chain lauded for its surprisingly good food and drink selection, has teamed up with a local brewery to unleash a limited edition oatmeal stout. The beer, dubbed Winter Reserve Coffee Stout, is an oatmeal stout made in partnership with the 2SP Brewing Company that's steeped with Wawa's special "Winter Blend" coffee. The result is a brew that evokes flavors of "sweet clove, dark chocolate, and graham crackers," the company said. So, yeah, it basically tastes like Christmas. To be one of the first to get your hands on some, you'll need to stop by the Wawa in Chadds Ford, Pennsylvania on December 6 between 4pm and 6pm, which is when it will be unveiled during a special event. Otherwise, it'll be available for purchase starting December 10 in select locations around five Philadelphia county areas. You'll need to act fast, though, since they're only releasing 1,000 cases. “At Wawa, supporting our local neighbors is at the heart of everything we do, which makes our special partnership with 2SP so crucial at our Chadds Ford store, our only Pennsylvania store to sell beer," said Mike Sherlock, Wawa's chief product marketing officer in a press release. "We are both happy to call Delaware County our hometown and we’re excited to team up to create a Winter Reserve Coffee Stout using our new limited-edition Wawa Reserve Winter Blend allowing us to add even more value to our customer experience just in time for the holidays." So, for those of us outside the Keystone State, now would be a good time to start sweet-talking your Pennsylvania-area friends into securing a case or two.